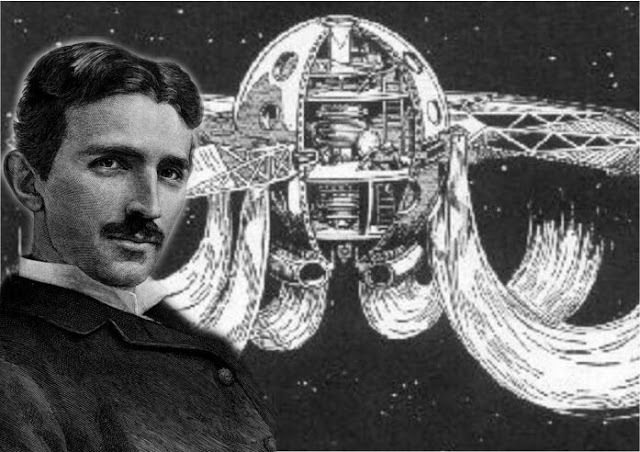 In 1895, during research with its transformer, Nikola Tesla had its first indications that time and space could be influenced by the use of highly charged spinning magnetic fields. Part of this revelation came from Tesla’s experimentation with radio frequencies and the transmission of electrical energy through the atmosphere. Tesla’s simple discovery would, years later, lead to the infamous Philadelphia experiment and Montauk time travel projects. But even before these ultra-secret military programs came along, Tesla made some fascinating discoveries about the nature of time and the real possibilities of time travel. With these experiments in high voltage electricity and magnetic fields, Tesla discovered that time and space could be violated, or deformed, creating a “door” that could lead to other times. But with this monumental discovery, Tesla also discovered, through personal experience, the real dangers inherent in time travel. Tesla, in contact with the resonance of the electromagnetic charge, found itself outside its space / time window reference. He reported that he could see past, present, and future all at the same time. But he was paralyzed within the electromagnetic field, unable to help himself. His assistant, turning off the power, saved Tesla before any permanent damage was done. The repetition of this same incident would occur years later during the Philadelphia Experiment. Unfortunately, the involved sailors were left out of their space / time window reference for long with disastrous results. Tesla’s secret time-travel experiences continued in the hands of others who were not as concerned about humanity as Tesla.